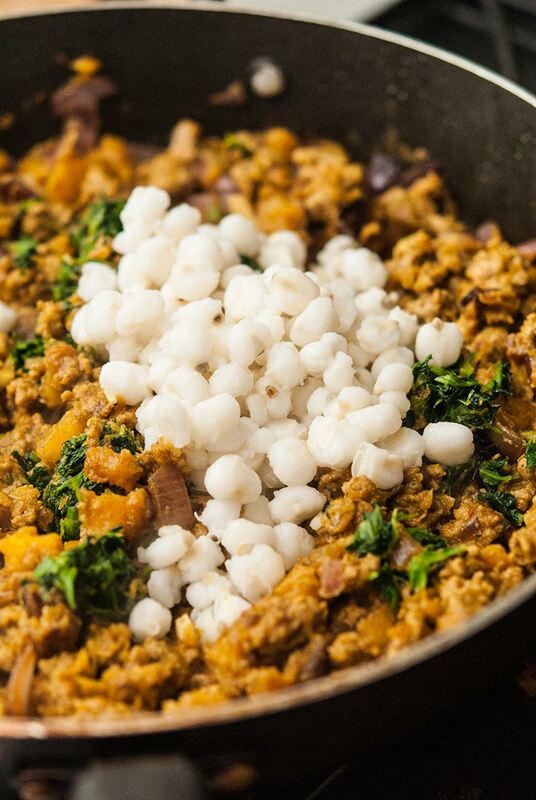 This curry butternut squash with turkey, spinach and hominy is an elegantly spiced, gluten-free, one-pan meal that takes only 45 minutes to make! 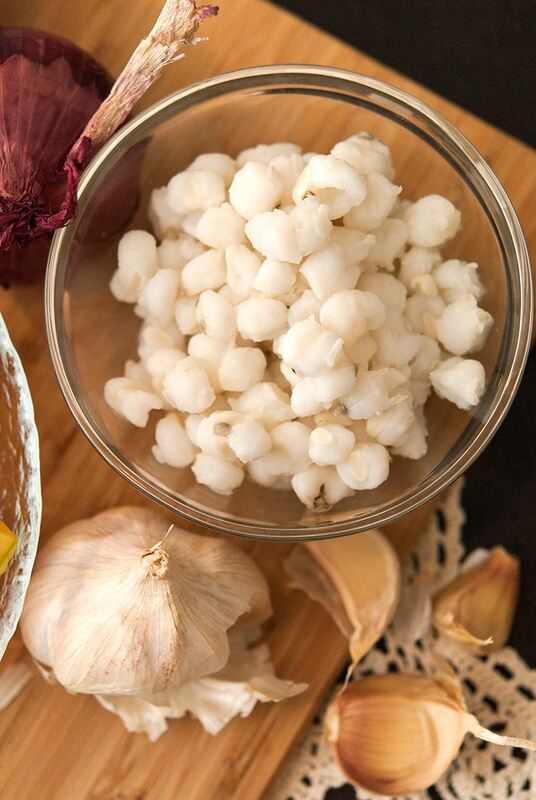 If you’ve never used hominy in your cooking before, you’ll love it! It’s a plump, chewy kernel of white corn that’s been dried and soaked in a mineral lime bath. It has a mild flavor and is traditionally used in Mexican cooking, but I thought it would add the perfect texture to this Indian-spiced meal! 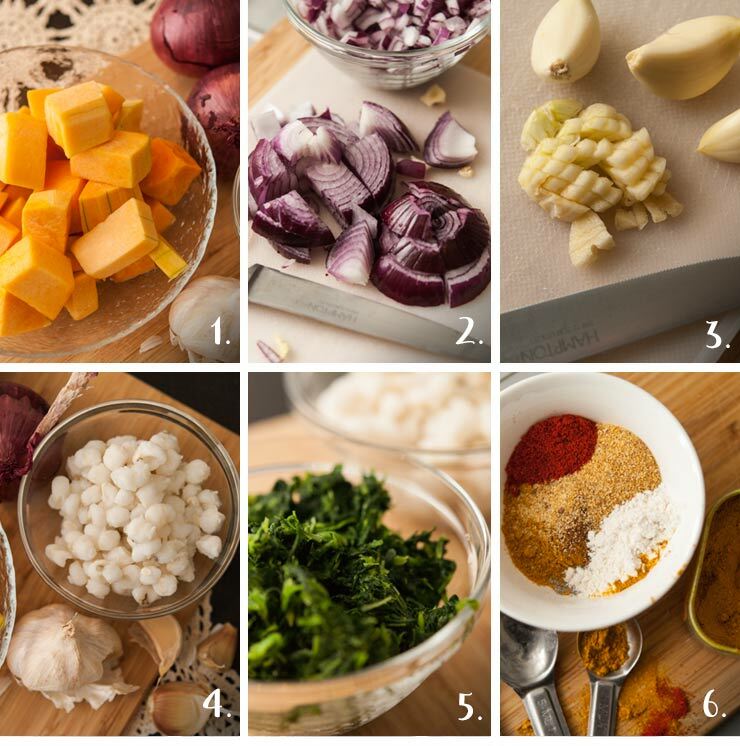 Hominy doesn’t just add a great flavor and texture to this tasty meal, it’s very nutritious! It’s rich in B vitamins, full of fiber, low on calories, low on sugar, it’s gluten-free and has almost no fat! How Should I Serve This Meal? You can serve it on top of rice or served with a fluffy piece of Naan bread. But if you’re looking to cut back on the carbs, you can certainly eat it just as it comes, like a stew. Personally, I just put it in a bowl and eat it with a big soup spoon! How Spicy Is This Recipe? The spiciness of this recipe is on the “hot” side, so if you want to pull back on the cayenne pepper, go right ahead. Personally, though, I like to add a whole table spoon of hot sauce to spice it up even more, but to each their own. Can It Be Reheated and Stored For Later? Of course it can! Simply store it in a container with a lid in the fridge for at least a week and a half, or freeze it. It thaws perfectly, and just as deliciously as if you just made it. What Kind of Curry Should I Use For This Recipe? 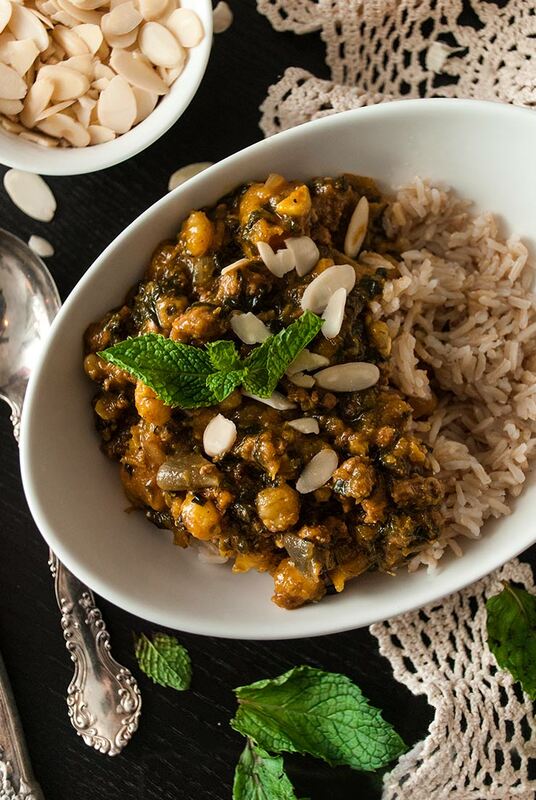 I used a Moroccan style curry called Ras El Hanout (which translates to “top of the shop,” implying a mixture of the best spices a shop has to offer), but any kind of Indian, Caribbean or Thai curry will do! 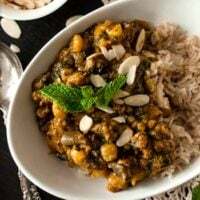 The measurements for this recipe should be perfect for most curries, but if you know yours is either on the strong or weak side, take it into account when adding, especially if it’s on the strong side. Add just a little at a time when you’re mixing in your spices and taste. What Will I Need to Make This Recipe? A cutting board and sharp knife for chop’n veggies. 1. Prepare your ingredients. 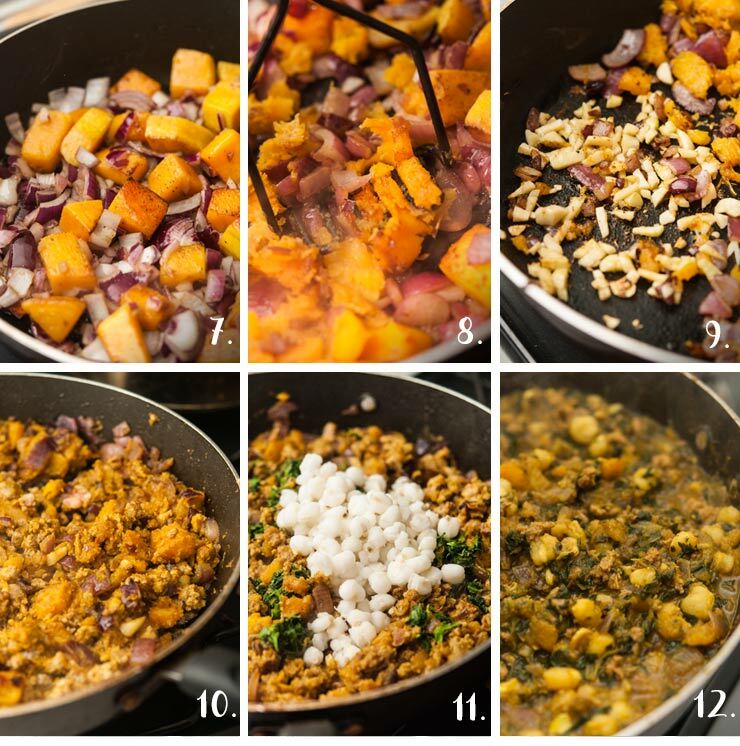 Chop your butternut squash into small-medium size cubes, (discard the hard skin). 2. Chop your 2 small red onions into chunky slices. 3. Mince your 4 garlic cloves. 4. Open your can of hominy and carefully pour out the juices. Once drained set aside. 5. Drain your thawed, chopped spinach and set aside. Make sure all the water is squeezed out. 6. Combine your spices in a bowl and set aside: ½ tsp. cardamom, 2 tsp. curry, ½ ground nutmeg, 2 tsp. garlic powder, 1 tsp. flour, ½ tsp. cayenne pepper, 1 tsp. sea salt, and ½ tsp. black pepper. 7. Over a medium flame, add your butternut squash to your skillet with 2 tbsp. of olive oil. Brown your squash for about 5 minutes, then add your onions. Cook together until squash is tender, about 5 more minutes. 8. Gently mash your butternut squash. Allow it to stay a bit chunky. You just want to beak it up a tiny bit. 9. Use a spatula to gently push your squash and onions to one side of the pan, add a drizzle of olive oil to the empty side and brown your minced garlic, making sure it doesn’t burn. It cooks quickly so you want to use a spatula to scrape it up and mix it around. This takes about 3-5 minutes. 10. Once your garlic is brown, add your turkey and chop it gently into your mixture. Brown for about 5 minutes, then add your spices and mix. 11. Add your spinach and hominy. 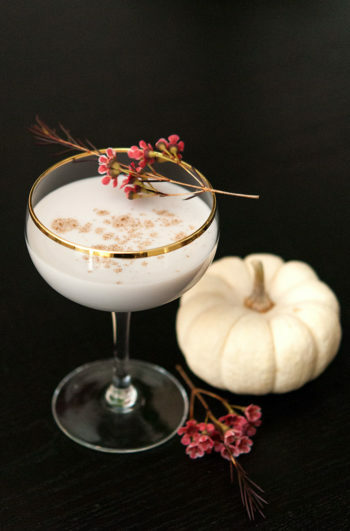 Gently mix into your spiced turkey and vegetables. 12. Add 3½ cups of chicken stock to the pan, raise the temperature to high and stir. Allow to boil and reduce to your desired texture. If you want it to be more of a stew, let it reduce over a high flame, stirring often, for about 10 minutes. For more of a thick soup, allow it to reduce for 5-10 minutes. For More Curry – Spiced Inspiration, Take a Look at These Tasty Recipes! Don’t forget to follow me on INSTAGRAM @shekeepsalovelyhome, on PINTEREST and FACEBOOK! And if you ever make any of my tasty drinks or treats, take a picture and tag me. I want to see! 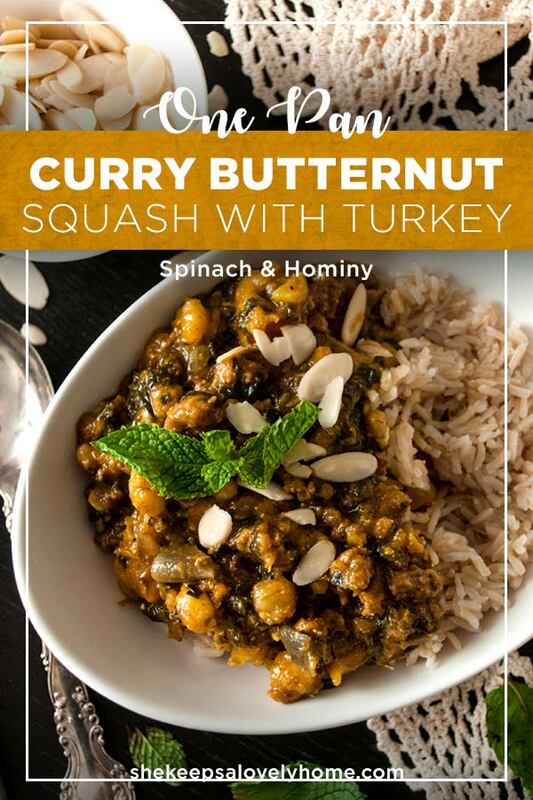 This curry butternut squash with turkey, spinach and hominy is an elegantly spiced, gluten-free, one-pan meal that only takes 45 minutes to make and is such a perfect make-ahead meal! Prepare your ingredients. Chop your butternut squash into small-medium size cubes and discard the hard skin. Chop your 2 small, red onions into chunky slices and mince your 4 garlic cloves. Open your can of hominy and carefully pour out the juices. Once drained set aside. Drain your thawed, chopped spinach and set aside. Make sure all the water is squeezed out. Combine your spices in a bowl and set aside: ½ tsp. cardamom, 2 tsp. curry, ½ ground nutmeg, 2 tsp. garlic powder, 1 tsp. flour, ½ tsp. cayenne pepper, 1 tsp. sea salt, and ½ tsp. black pepper. Over a medium flame, add your butternut squash to your skillet with 2 tbsp. of olive oil. Brown your squash for about 5 minutes, then add your onions. Cook together until squash is tender, about 5 more minutes. Gently mash your butternut squash. Allow it to stay a bit chunky. You just want to beak it up a tiny bit. Use a spatula to gently push your squash and onions to one side of the pan, add a drizzle of olive oil to the empty side and brown your minced garlic, making sure it doesn’t burn. It cooks quickly so you want to use a spatula to scrape it up and mix it around. This takes about 3-5 minutes. Once your garlic is brown, add your turkey and chop it gently into your mixture. Brown for about 5 minutes, then add your spices and mix. Add your spinach and hominy. Gently mix into your spiced turkey and vegetables. Add 3½ cups of chicken stock to the pan, raise the temperature to high and stir. Allow to boil and reduce to your desired texture. If you want it to be more of a stew, let it reduce over a high flame, stirring often, for about 10 minutes. For more of a thick soup, allow it to reduce for 5-10 minutes.